As a native of El Paso, Texas; Karen is one of "El Paso's Natural Real Estate Resources"
Karen Porter is a licensed real estate Broker whose areas of specialization include representation of home buyers, home sellers and property management. 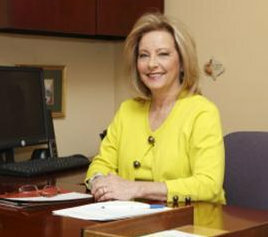 Karen is active on the local and state-level of Realtor organizations which include her roles as President of Greater El Paso Association of Realtors in 2004 and Salesmen of the Year in 2001; President of the El Paso Builders Auxiliary in 1988/1989; and TRECPAC Trustee for Texas Association of Realtors for two years. Karen also enjoys participating in community efforts which most recently includes her position as President-elect of the Women’s Club of El Paso and her previous roles as docent at the El Paso Museum of History and Co-chair of the El Paso Symphony Guild Debutante Ball. Karen is devoted to her customers and clients; her husband of 49 years, Albert; her daughter, Amy; her 4 Yorkies Stuart, Sophie, Chloe and Ruby; and her rescue dog Buddy.